Compiegne, France – On Saturday, eight international teams began CDIO5* competition with the Grand Prix Test at Compiegne. After stellar performances from The Dutta Corp. U.S. Dressage Team of Allison Brock, Shelly Francis, Laura Graves, and Kasey Perry-Glass, the U.S. led the field on a total of 226.800. Day two of CDIO5* competition was to include the Grand Prix Special and Freestyle tests, but a deluge of rain caused the cancelation of the remaining Nations Cup competition. Based on day one’s dominate performances, the U.S. took the Nations Cup win, followed by Sweden in second on 215.040, and France in third with 213.660. The competition served as a designated observation event as part of the selection process for the 2016 U.S. Olympic Dressage Team. In their second Nations Cup appearance, Perry-Glass (Wellington, Fla.) and Diane Perry’s Goerklintgaards Dublet continued to show maturity and poise with a superb test, scoring a personal best and posting the highest scoring Grand Prix Test of the day with a 77.440%. Having moved up to the Grand Prix level this winter, the pair executed an accurate test that earned 8s and 9s for their one-and-two-tempi changes and final centerline. Anchoring the U.S. team was Graves (Geneva, Fla.) and her own Verdades, who produced a score of 75.440%. The pair earned high marks for their signature expression in the extended gaits, two-tempi changes, and half-passes, but had an uncharacteristic mistake in the one-tempi changes. Graves placed second behind teammate Perry-Glass. Entering the arena second in the order for the U.S., Brock (Loxahatchee, Fla.) and Claudine and Fritz Kundrun’s Rosevelt, performed an expressive and fluid test, scoring 73.920%, good for sixth place. Producing a very consistent test, the pair showcased beautiful extension and cadence at the trot and in the half-passes. The veteran pair of Francis (Loxahatchee, Fla.) and Patricia Stempel’s Doktor were the pathfinders for the U.S. and set the tone for polished performances from the American contingent. 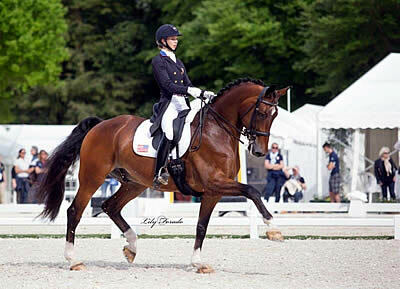 The pair showcased excellent piaffe-passage work to score 71.120%, placing them ninth in the Grand Prix. The trio of USEF Dressage Young Rider European Tour participants gained valuable experience in their European debuts, competing in the CDI-Y. Lauren Asher (San Diego, Calif.) with her own De Noir 3 were the highest placing Americans in both the Team and Individual Tests. In Friday’s Team Test, the pair scored 67.061%, placing 19th. Asher went one better in the Individual Test, placing 18th with a score of 66.228% in a test that earned high marks for the medium and collected trot and extended walk. Moving forward to the Freestyle on Sunday, Asher rode with remarkable poise under less than ideal weather conditions. The judges were impressed with the choreography and degree of difficulty, awarding the pair a score of 71.958% and placing it fourth in the class. Barbara “Bebe” Davis and Michael Davis’ Feivel Mousekewitz scored 63.816% in the Team Test, placing 24th, and earned 65.614% for 23rd place in the Individual Test. Rounding out the U.S. representatives, Kerrigan Gluch (Wellington, Fla.) and Hampton Green Farm’s Vaquero HGF placed 27th in the Team Test with a score of 65.000%, and placed 31st with a 60.263% in the Individual Test.